Dr. Sebi's natural healing retreat is a Tropical Sanctuary nestled in the hills of the coastal city of La Cieba, Honduras. The Usha Village is a haven; a place where you finally slow down and let go of old habits, and allow your body to begin a once in life-time revitalization experience. The Usha Village Services offers a plethora of amenities including dinning on delicious healthy meals from a nutritious menu that has received Dr. Sebi's personal seal of approval. Along with the wonderful healthy foods, patroons receive Dr. Sebi's mineral rich herbal compounds. 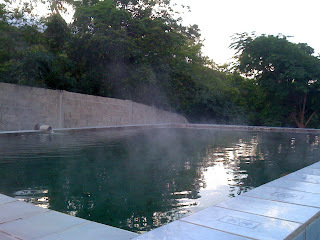 But the highlights of your revitalization experience at the Usha Village will without a doubt be the sulfur rich baths. The bath waters contain the highest levels of alkaline, possessing a pH greater then 7. You owe it to yourself to experience this once in a life-time journey. Patrons wishing to visit the Village must make their own travel arrangements. YOUR DESTINATION WILL BE LA CIEBA HONDURAS. Patrons must utilize the Cab Service at the Airport. Once you tell the Cab driver your destination is Dr. Sebi Usha Village they will know where to take you. The fare for the cab ride is $40.00. We advise a courtsey $5.00 tip. Summer clothing would be the ideal attire for your stay. Make sure you bring a pair of sneakers, sandals and shorts. There are no televisions. The village is a serene environment. Reading materials are suggested. "I learned there are no bad people, only sick people"
The main attraction at Dr. Sebi's Healing Village are the incredible Thermal Water Baths. Why? Because the pH of the thermal waters is 8, 9.6, 8.9, which is extremely high. Any substance that has such a high concentration of hydrogen, iron concentration is effective in healing the body because it is oxygen that heals; nothing else but oxygen.